Probably not. But if there are any they'll be closer tonight then they will be for another 13 years since their planet's and our planet's orbits bring us closer together than they have been for a good long while. That's Mars shown above (the pumpkin coloured one) in a photograph taken near Payson, Arizona a few days ago. You can see the red planet yourself in tonight's sky. The article is here. A larger version of that picture is here. ". . .If We ordain that the whole Catholic world shall revere Christ as King, We shall minister to the need of the present day, and at the same time provide an excellent remedy for the plague which now infects society. . . .The empire of Christ over all nations was rejected. The right which the Church has from Christ himself, to teach mankind, to make laws, to govern peoples in all that pertains to their eternal salvation, that right was denied. Then gradually the religion of Christ came to be likened to false religions and to be placed ignominiously on the same level with them. It was then put under the power of the state and tolerated more or less at the whim of princes and rulers. Some men went even further, and wished to set up in the place of God's religion a natural religion consisting in some instinctive affection of the heart. There were even some nations who thought they could dispense with God, and that their religion should consist in impiety and the neglect of God. The rebellion of individuals and states against the authority of Christ has produced deplorable consequences. We lamented these in the Encyclical Ubi arcano; we lament them today: the seeds of discord sown far and wide; those bitter enmities and rivalries between nations, which still hinder so much the cause of peace; that insatiable greed which is so often hidden under a pretense of public spirit and patriotism, and gives rise to so many private quarrels; a blind and immoderate selfishness, making men seek nothing but their own comfort and advantage, and measure everything by these; no peace in the home, because men have forgotten or neglect their duty; the unity and stability of the family undermined; society in a word, shaken to its foundations and on the way to ruin. We firmly hope, however, that the feast of the Kingship of Christ, which in future will be yearly observed, may hasten the return of society to our loving Savior. It would be the duty of Catholics to do all they can to bring about this happy result." Back issues of "Gilbert". The latest number arrived last week and one is duty bound to make at least the attempt to catch up before starting the new one. "Off the tracks and hurtling forward, toward an unknown destination." Peggy Noonan's lastest in Opinion Journal strikes a resonant chord. As non-specific as she is, a lot of us know exactly of what she writes. Hilary used to write about this sort of thing in Fiat Mihi. So occasionally do Jeff Culbreath and others. All from different viewpoints, of course, and not limited to the political sphere. But the sense that the wheels have indeed come off the trolley is not Miss Noonan's alone. See if you recognize the experience. The recent synod did have some good things to say about Latin. One of the synod’s 50 “propositions” to the Pope is that the language should feature prominently in Masses at major international events, where Catholics speaking many different languages are present. It is expected to appeal to the Pope, who in June invited Catholics to pray in Latin whenever possible, emphasising its universal dimension. “Latin makes it easier for Christians from different countries to pray together, especially when they meet for special occasions,” he said . These little rays of light appear every once in a while but nothing seems to come of them. But hope springs. . .perhaps under this pope. The entire article from The Times of London can be found here. And, of course, since we were at the heart of all that there was no time to devote to The Inn. It's the anxiety, you know. The anxiety stifles creativity, what with all the waiting by the phone trying to decide which of the vacancies to accept when the President or the McCourts call. We've almost decided to go with the Dodgers' GM position. Sure, the Supreme Court position is tempting. But that DC weather. That could be the deciding factor. And it would mean giving up our residence here on the fashionable, albeit understated part of Lakewood (i.e., on the east side but west of the river). Decisions, decisions. A Cultural Catholic? You Need to Ask? God has given you the rare gift of bilocation. the parish bake sale committee meetings. incredible power you wield in our parish. Yes. Well. I don't know that we actually needed a quiz but it is nice to have one's suspicions about oneself confirmed scientifically. The bit about the parish bake sale committee meetings may not be exactly right, but my soda bread is indeed a force to be reckoned with. If you have been following the story - not to say the outrage - you know that one of the finest Catholic cathedrals in Ireland is to be vandalized by its bishop. Recta Ratio has had much on the story including some gorgeous photographs. Now he provides a link to a website put up by some folks who plan on doing something about it. You can find it here. An excellent project, worthy of support. 200 years ago today Lord Nelson and the British fleet put paid to naval portion of the French megalomaniac's dreams of world conquest. Alas, more than a few crack-pot theories which grew out of the French revolution have spread themselves world wide in spite of the French defeat. We live with the results. But God bless Nelson for slowing them down for a while. The official Trafalgar bi-centennial anniversary site can be found here. The Battle itself. Lots of information and a page of good pictures. More pictures. This was last year's ceremony - the 199th anniversary. Here are some from today's. The Queen's participation in the day's ceremonies. Note especially some fascinating links at right of this page on the BBC's website including some video clips of the wreath-laying ceremony, Spain's take on the day (Trafalgar is off the Spanish coast and there were Spanish vessels in the fight), and a summary of the day's events. But alas it isn't Nelson's England any more. This page provides a travelogue of examples: No cooing at babies allowed; it insults their intelligence. No flying of the cross of St George in London; it resembles a crusader's cross and Mohammedans might be insulted. Which is also why you'll have trouble finding a piggy bank. Maybe there won't always be an England. "This [new bankruptcy] law reeks of hypocrisy to me. And no, this isn't political, given that the bill was a bipartisan smackdown of the average American. It seems to me that lower-income individuals are being held to a much higher standard than our largest companies are. Under a corporate bankruptcy, a company like Delta can avoid numerous obligations like health or pension benefits in order to remain in business. But a "fresh start" for ordinary citizens was not deemed worthy. Not even the victims of hurricanes Katrina and Rita will be given any special treatment under the new law. Maybe former presidents George H.W. Bush and Bill Clinton can be rolled out for a fundraiser or two in a couple of years to help some of the hurricane victims meet their Chapter 13 obligations. "The double standard here is glaring. Recently, rising jet fuel prices nudged Delta and Northwest into declaring bankruptcy. Rising energy prices in addition to rising health-care costs are placing many Americans in equally difficult positions. Why are we more unforgiving of individuals than we are of corporations? "Essentially, the law will make it harder for individuals to file for a Chapter 7 bankruptcy, which allows you to liquidate your assets to pay off some of your debts. Any remaining debts above the amount of your assets are then canceled. The credit card companies often fail to collect from their customers under this form of bankruptcy, so obviously, they wanted to reform the system. "As of today, more people will be required to file a Chapter 13 bankruptcy, which will require individuals to enter into a payment arrangement lasting from three to five years in order to repay their debts. Last year, 1.1 million people filed for Chapter 7 bankruptcies, while approximately 450,000 filed for Chapter 13. "Luckily for the likes of Delta, Northwest, and, dare we say, GM(NYSE: GM), Chapter 11 bankruptcies, which apply to corporations, were left untouched by the reform." Further thoughts with a bit more detail here. Originally noticed at Jerry Pournelle's site. Archbishop John J. Myers, who last month met with Pope Benedict XVI for the first time since Benedict was elected, has been appointed by the Congregation for the Doctrine of the Faith in Rome as Ecclesiastical Delegate for the Pastoral Provision for admitting married former Anglican clergy to the Catholic priesthood in the United States. In this post, which reports to Archbishop William Levada, Prefect of the Congregation, Archbishop Myers will work with all bishops in the United States to oversee the processes by which Anglican/Episcopalian clergy who wish to convert to Catholicism can be ordained as Catholic priests. Previously, the post of Ecclesiastical Delegate had been held by former Boston Archbishop Bernard Cardinal Law. In speaking of the appointment, Archbishop Myers stated: "The purpose of the Provision is to allow a pastoral way for the Church to welcome those men who wish to enter fully into the Catholic faith and continue in ministry, but because of the tradition they had been following, they would not normally have been welcomed. I'm grateful that the Holy Father and Archbishop Levada have placed their trust in me to assist in welcoming these men into the Church, and to work with my brother bishops on this delicate but important service." In 1980, Pope John Paul II, in response to requests from priests and laity of the Episcopal Church who were seeking full communion with the Catholic Church, made possible the ordination of married Episcopal priests, and also authorized the establishment of personal parishes in dioceses of the United States. Since 1983, some 78 former Episcopalian priests have been ordained for priestly ministry in Catholic dioceses of the United States. Seven personal parishes - five in Texas, and one each in Massachusetts and South Carolina - have also been formed. These parishes retain certain liturgical elements proper to the Anglican tradition, yet they are Catholic. This practice is similar to that extended to Eastern Rite Churches that recognize papal authority, but continue to worship according to their ancient liturgical traditions. The parishes submit to the authority of the local bishop in the diocese where they are located. Ordination to Catholic priesthood does not come immediately for men who have petitioned under the Pastoral Provision. If accepted as candidates, each man must receive theological, spiritual and pastoral preparation for ministry in the Catholic Church. In the United States, there currently are three men in process for ordination. Rome is now considering the request of another four. Six others have made inquiries about the Pastoral Provision through local bishops in the United States. The Archdiocese of Newark is not only the center for the Pastoral Provision activities in the United States, it is the home of one man undergoing this process of training for Catholic priesthood. Alvin Kimel, formerly pastor of St. Mark's Parish, Jonestown, PA, was accepted this past summer as a candidate under the Provision. He and his wife, Christine, are living in Hillside as he serves as campus minister at Kean University in Elizabeth. In the meantime, he is pursuing preparation for eventual ordination if his petition is favorably received by the Holy Father. Some would believe that the institution of the Provision, and the ordination of married Episcopalian priests, should signal a change in the Church's tradition of mandatory celibacy. The National Catholic Register this past summer posed this question to both Episcopalians who have converted and been ordained, and well as Catholic scholars. The sense is that celibate clergy will remain the norm. "It's a pastoral response to the situation of an Episcopal priest who came to the fullness of faith in the Catholic Church," said Father William Stetson, the Washington, D.C.-based priest who handles applications for ordination under the provision in the United States, and who will coordinate the process with Archbishop Myers. One priest who recently was ordained under the Provision expressed that he wanted only to become fully Catholic. He felt that God was merciful to allow this to happen, and that his ordination was very much an exception to the rule. He also cautioned that the presence of married Episcopalian priests should not become a means to chip away at the gift of celibacy or other issues that at times rankle some Catholics. When I do find out from whence it cometh I'll put the link here. ADDENDUM: And here it is on the Newark Archdiocesan newspaper's website. (Same day service!) Thanks to JB and the AU mail list. Roman Rite Mass in Latin? What's that? Our episcopal fathers-in-God either don't know or don't care. John Allen's latest column reports that the Synod's "Message" includes no mention of the traditional Roman Rite one way or the other. “The lack of priests to celebrate the Sunday Eucharist worries us a great deal and invites us to pray and more actively promote priestly vocations,” the message says. The bishops also call for fidelity to liturgical rules. But apparently none of this has anything to do with the ancient liturgy of the Church last codified by Blessed Pope John XXIII in 1962. Never mind that neither of these problems exists in the context of the traditional Roman Rite and its communities. What is the point of these synods anyway? Are they just a sort of Shriner's convention for bishops, minus the miniature cars? A chance to get away from the local diocese and the subpoenas for a few weeks and relax in Rome? Has anything ever improved thanks to one of these gatherings? Or even changed? The President won't be pleased. Liberation of the Roman Rite Mass? A rather deafening silence at the Synod of Bishops about the pre-Vatican II Mass was broken on Saturday, when Colombian Cardinal Darío Castrillón Hoyos proposed that the bishops' final message contain an opening to Catholics attached to the old Mass, perhaps treating it as one among several approved rites in the Catholic church. Sources told NCR that Castrillón Hoyos did not specifically mention the idea of a "universal indult," meaning permission for priests to celebrate the old Mass whenever they like, but that his remarks "could be read in that way." The rest of the article can be found here. Indications in the rest of the article aren't as promising as the lead paragraphs. Take a look at the committee charged with drafting the "Message". After Cardinal Pell, everyone is either indifferent to the ancient rite or positively opposed to it. Thinking of becoming a Mohammedan? No? Well, your 12 year old may be. Especially if you're letting the Byron Union School District educate him. They've decided to to a little sub-rosa proselytizing in that area. Well that hasn't been my motto lately, has it. But now that the play-offs are over and any team I might have had an interest in has gone down for the third time and I am recovering nicely perhaps a few more posts may appear here. Or not. I mean, the World Series is, after all, the World Series. Just possibly it may eat up a few evenings. But how do you drum up interest in the Astros vs. the White Sox? My wife insists that because my mother's people were all Chicago folks that my natural allegiances should kick in here. But she doesn't understand. They were - and so far as I know still are - Cubs fans. One of my grandfather's best friends was Joe Tinker, "Uncle Joe" in the family. The very first professional baseball game I ever attended was a Cubs game in Wrigley Field. I couldn't have been more than five. My grandmother was babysitting and she took me. 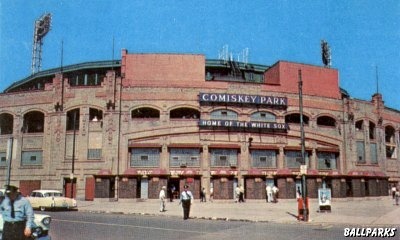 Comiskey Park wasn't on my family's radar screen. I doubt if Cellphone Field, or whatever it's called, would be either. I would've like to see Davey Eckstein get to play in another Series, but alas, the Cards folded last night. So we'll see what happens with the Angels come springtime. Washburn may be gone, which may not be a bad thing. Especially if they can get a good left-hander in his place. And Alfred E. "What-me-worry?" Santana will have a whole winter to focus and, maybe, worry just a little. A play-off game isn't just another baseball game, my friend. And whole lot of folks can re-familiarize themselves with the baseball bat. People getting lebenty-leben million dollars a year really ought to hit better than .050 in the post season. THE DODGERS have dismissed John Olguin, the VP of public relations, and replaced him with Camille Johnston, who among other things had been the Midwest communications director for the Clinton-Gore reelection campaign. Great — a new spin-control expert to break in. The announcement came from "Dodger Vice Chairman and President Jamie McCourt," or better known on Page 2 as "Size 0." In looking at Johnston's resume, I'd imagine her political background and work as director of communications for Tipper Gore swung it for Size 0. The fact that the woman who hired the woman who knows nothing about baseball knows nothing about baseball is in keeping with the McCourt in-over-your-head strategy for success that has worked so well already with the hiring of GM Paul DePodesta. Johnston holds a degree in political science from UCLA, which should really help her in dealing with local sportswriters. She worked recently for the publishing company that put out Pete Rose's memoir, "My Prison Without Bars," which she'll understand better after working for the Dodgers. A check of the Internet revealed some of her past work. When it was reported that Al Gore might be spending his last week in office vacationing in Aspen, Johnston "would neither confirm or deny reports." That's the kind of communication you'd expect from someone being hired by the McCourts. Tipper and Johnston worked together on a story for USA Today disclosing Tipper's treatment for depression, and according to Johnston's published remarks, they were passing the manuscript "from my bra to hers, and back again." For some reason I don't think we'll be hearing the same thing when it comes to working closely with Jeff Kent. I've lost count of the number of Dodger PR employees already let go by the McCourts in their flailing effort to control the media here, but in addition to Olguin, assistants Chris Gutierrez and Paul Gomez were added to the list. Olguin was a 14-year Dodger employee and highly regarded by the media, which probably doomed him. "I'll always be a Dodger fan and I wish them nothing but the best," he said in offering a classy farewell. The Dodgers also announced they will be ending their relationship with the crisis manager hired six months ago to make the McCourts look better — even though her work isn't done. And now after Jim Tracey's firing (or liberation, depending upon how you look at it) the McCourts and DePodesta are deep in their search for a new manager who will fall in with their "ideas" and, of greatest importance, work cheap. The poor man. Whoever manages the Dodgers in 2006 will be the archetypal maker of bricks without straw. I played for this ceremony yesterday. A Long Beach Police Department K-9 dog was shot and killed over the weekend and the PD held a ceremony for his interment. This is actually the second memorial I've played for a dog. It's California. What can I tell you? O.K., I confess: I am an unrepentant lover of dogs. And it was a nice ceremony. You can see some pictures in a slide show the local paper put up on its website with some pretty O.K. piping in the background, if I do say so myself. It's here. ". . .et ne nos inducas in tentationem." I've thought about commenting on this all morning. It may be stretching Christian charity too far. But I'm going to attempt it. Perhaps if I just muse on how this might affect how the game is played. For instance: what other umpire signs don't really mean what everyone's thought they meant for the past, oh, say, 130 years? If a ball close to the line is called foul, maybe the runner ought to high-tail it to first anyway until the umpire says he's sure. And maybe the fielder ought to keep after it and throw it to first just in case. Letting the ball boy get it just because the umpire says it's foul could have unfortunate consequences. Who knew that baseball rules were so like the U.S. Constitution. Things just sort of emanate from the penumbra. There now. I wasn't to hard on poor, unfortunate Mr Eddings was I. Not in print anyway. Poor Mary had to listen to the verbal tirade last night, though. I think it even woke her up. "Domine, minuisti "Yankees" paulo minus ab angelis. . ."
. . .well, no not here. But Chicago, anyway. Once there were Giants. . .
. . .and once we had bishops with the courage to stand up to more fearsome opponents than the Times and the Tablet. One of them, Clemens August Cardinal Graf von Galen, will be beatified on Sunday. . . .says the book of Proverbs. So, of course, many of them rise to the top. Witness his Lordship the Archbishop of Dublin. I can't even come up with a snappy closer; what a pathetic excuse for a bishop. Woe to you, shepherds of Israel. . .
but you ruled over them with rigour, and with a high hand. But more than that, really. The essay is entitled "The Meirs Misstep". But it has interesting things to say about the Supreme Court in general, the ramifications of George W's style of appointing, and much else. ROME, October 4 (RIA Novosti) - The Russian Orthodox Church considers current discussions at the Catholic Synod of Bishops assembly in the Vatican to confirm the Orthodox Church's traditional values, a Russian bishop said Tuesday. Bishop Yegorevsky Mark, deputy head of external relations for the Moscow Patriarch, who is leading a Russian Orthodox Church delegation to the Vatican, said decisions made by Catholic leaders over liturgical issues would ultimately result in a return to traditions. More than 250 bishops are attending the general assembly, which opened Monday. The assembly, scheduled to run for three weeks, is focusing on the theme "the Eucharist, source and summit of the life and mission of the Church". Mark said changes made 40 years ago had substantially relaxed access to Catholic communion. "The aim of the Catholic Church to adapt to the modern world, to make Christianity more understandable and 'easy' for the world has had serious negative consequences," he said. According to Mark, this situation has also caused a reverse reactionary process, geared towards returning to the same traditions the Orthodox Church has faithfully observed. "We view this process as a confirmation of the correctness of our own experience and the importance of maintaining our traditions," the bishop said. If you dropped a bundle on a high-end computer display or HDTV, you could be in for an unpleasant surprise when you slip your new high-definition DVD ofStar Wars: Episode IIIinto your Windows Vista PC. Vista, the next version of Windows that's slated to appear in about a year, will feature a new systemwide content protection scheme called PVP-OPM (see box below). If your monitor doesn't work with PVP-OPM, all you'll likely see is either a fuzzy rendition of your high-def flick or Hollywood's version of the Blue Screen of Death--a message warning you that the display has been 'revoked'. This was sent to me a few moments ago. O.K., I am somewhat mollified if not convinced. The issue is of the highest importance. But it is not the only one. See some of the links from yesterday and today. Two folks took issue, not to say umbrage, with my, shall we say, skepticism yesterday regarding the proposed appointment of Miss Meirs to the Supreme Court. Both cited Hugh Hewitt's blog as a worthy defense of the appointment. In the first place, thanks very much for the citation. I'm always delighted and flattered when anyone gives a tinker's dam what I think about anything. But, alas, I remain skeptical and unconvinced. He had quite a bit to say about it and more today. You can read it at the link above. So far as I can tell, though, it boils down to "trust the president". This is probably a good enough argument for Mr Hewitt because he trusts the president anyway. He voted for him and campaigned for him. I did neither. (Although I certainly didn't vote for the ghastly John Kerry, either. In case you were wondering.) I don't trust President Bush and I see no reason to make an exception in this case. The woman does appear to be pro-life. This is very good. But according to the Times this morning, one of her closest friends says her convictions will not cause her to overturn Roe v. Wade. So what are her pro-life convictions worth? Some of the most consistent anti-life legislators claim to be "personally opposed" to abortion. Supreme Court nominee Harriet E. Miers is personally opposed to abortion, her longtime companion said Tuesday, but he added that doesn't mean she will vote to overturn Roe vs. Wade. Nathan L. Hecht, a Texas Supreme Court justice, has been a close companion of Miers since they first worked together for a Dallas law firm 30 years ago. His comments are the clearest indication to date of Miers' view on abortion — which, as with other issues she would be likely to face on the high court, is unknown. "Harriet goes to a church that is pro-life. She has for 25 years," he said. "She gives them a lot of money. Her personal views lie in that direction." But when asked if her personal opposition to abortion would give her sufficient cause to overturn the Supreme Court's abortion precedent, Hecht said, "I think she'll say they won't." And about the other social issues that have been raised? No comment it seems. For a superb essay on the inadvisability of this nomination, I suggest George Will's latest column. It's located several places on the web. The Washington Post has it here. R.I.P. : Lady Abbess Benedict Duss, O.S.B. The founding abbess of Regina Laudis Abbey has died. Her abbey was the first Benedictine foundation for women in the United States solely dedicated to the contemplative life. There were others that were intended to be so even in the 19th century but circumstances, including hostile bishops, always prevented it. The traditional round of monastic offices in Latin and with Gregorian chant has always been maintained at Regina Laudis, although Holy Mass is in the Pauline Rite. The Times has an extensive obituary dedicated to Lady Abbess Benedict here. The Abbey has a website here. That's what it says here, and, yes, the source is Pravda. That Pravda. But I would say it's probably true. It seems only to confirm the obvious. Wouldn't they be remiss not to be spying on the head of the Holy Office? A collection letters from a National Guard officer stationed in Iraq. Long, but very much worth your time. This article has been making the rounds. But there really isn't much new in it. One has hopes, but it is well to remember that both parties have not arrived at an agreement to this reunion as yet. And there is still the question of orders. (I think it's fairly clear that the continuing Angicans, at least those arising from the St. Louis Affirmation of 1977, have valid orders. Cf. this page. But I am neither theologian nor curia member.) And some, perhaps many, TAC or ACA parishes will not go along with a Roman reunion. Still. Speramus et oramus. Is this a first? David Frum disagreeing with his idol, G.W. Bush? I think it may be. There seems to be an avalanche of disappointment from every corner. The N.Y. Times in a remarkably perceptive piece thinks George has lost his nerve. Pat Oliphant in one panel captures the non-ideological reaction. Nor are the conservatives any happier. Witness brother Buchanan. Strolling further through the lush internet undergrowth, we found that David Frum is not the only member of the neojacobins to disagree with their leader. Rush isn't best pleased. Bill Kristol of the Weekly Standard is "depressed" and "demoralized". The the pillar of country-club Republicanism, the Wall Street Journal sees cronyism in the appointment. Then there's this sort of thing. One would think with the Frist and DeLay legal problems, that George would be avoiding even a hint of scandal. Apparently not. Apparently, for some. One small disagreement with the article linked in the headline: the use of the term "difference in philosophies" implies that dePodesta has a philosophy. He doesn't have a philosophy. He has a laptop. More on the ownership and alleged "management" of Los Angeles' national league franchise from Bill Plaschke and T.J. Simers. Can you say "eviscerate"? I knew you could. O.K., "of Anaheim" if you insist. Even The Times calls OC part of "the L.A. metropolitan area". By either name or both they're still going to the playoffs in a few hours. And for those who care not a fig for the Los Angeles Angels of Anaheim, there is still the Yankees factor. As Mr Kirkorian points out, it adds interest to any contest. If one can't be a fan, one can always be an antifan. "Miers' record begins to fill in: Bush pick supported International Criminal Court, homosexual adoptions, women in combat, tax hike"
This is the second reading in today's Officium Lectionis. It's been there since the post-conciliar liturgy commission compiled the new office - thirty years, more or less - but never before did it make such an impression. Would that our Most Reverend Fathers-in-God would take it to heart. A spiritual guide should be silent when discretion requires and speak when words are of service. Otherwise he may say what he should not or be silent when he should speak. Indiscreet speech may lead men into error and an imprudent silence may leave in error those who could have been taught. Pastors who lack foresight hesitate to say openly what is right because they fear losing the favour of men. As the voice of truth tells us, such leaders are not zealous pastors who protect their flocks, rather they are like mercenaries who flee by taking refuge in silence when the wolf appears. The Lord reproaches them through the prophet: They are dumb dogs that cannot bark. On another occasion he complains: You did not advance against the foe or set up a wall in front of the house of Israel, so that you might stand fast in battle on the day of the Lord. To advance against the foe involves a bold resistance to the powers of this world in defence of the flock. To stand fast in battle on the day of the Lord means to oppose the wicked enemy out of love for what is right. To save me power-typing it out of the book, this version is copied from the Universalis. com site the owners of which do yeoman work in keeping an English version of the Liturgia Horarum on the web. A very useful tool for those who are bound to the new office and almost always in a better translation than that provided in the American English office book.